Hi, my name is Jeanne. I've been very blessed to have come aboard to Salon Eco. It's a great place to work and family friendly oriented. I have been in the beauty industry for 30 years. I am diversified in many aspects of hairdressing. One of my talents, I enjoy most, is color! Another is making people happy & feeling good about themselves. Hi, my name is Joanne. I would like to welcome you to Salon Eco. I have over 20 years experience in this industry. I am certified in both color and relaxers. I am accredited in highlighting and all types of haircuts and styles. Continuing education is important to me, it is essential in the beauty industry. As a long-time resident and professional in Mineola, it is my pleasure to serve this community. Hi, my name is Susan Anderson. I am very excited to be a part of Salon Eco. A salon team of highly experienced, talented and friendly stylists with a strong accent on continuing education to be able to best serve you. I am well versed in all phases of hairdressing with a passion for formal and up-do styling. I have over 25 years of experience and enjoy working with a client to create the best look for them whether it be coloring, cutting, texturizing or styling. Looking foward to serving you! 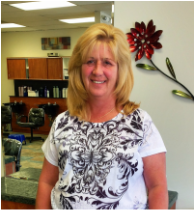 Hi, My name is Sharon Murano and I am happy to be a part of the Salon Eco team! I Have been a stylist for 40 Years; working with people and making them feel beautiful and happy is my Privilege. I specialize in perms, sets, colors, haircuts and styling. Come on into Salon Eco and let me attend to you! Hi, my name is Tina! I am happy to be a part of the Salon Eco team! It is my pleasure to share and create the vision of my craft by making people feel beautiful about themselves. I have been in the industry for 10 years. I love what I do and continue to pursue my education to keep up with the latest trends. I specialize in haircuts, color, highlights, ombre, keratin straighteners, make-up application and much more. Call or come in for a free consultation and I will be happy to accommodate your beauty needs!! Hello, My name is Ray. I am excited to be the newest member of the Salon Eco family. I have a passion for hair and beauty! I Specialize in Balayage, Color Melting and Hair Cuts! I have been in the hair industry for 5 years and I continue to pursue my education of the latest styles and techniques. Imperfection Is Beauty & Madness is Genius! ENTER YOUR EMAIL TO SUBSCRIBE TO OUR MONTHLY NEWSLETTER!